Check out our Tax Season Wrap-Up Guide for helpful tips about checking on refunds and making payments. We do not prepare taxes outside of tax season. Click here for additional free VITA tax sites. and how we approach everything we do. We lead by example. We aim high and follow a shared vision with defined needs and priorities. We believe leaders are humble, accountable, inspirational, passionate, ethical, and credible. We adapt to change while identifying and maximizing resources. We are flexible, reflective, and inclusive. We act purposely and creatively to achieve results. We work together. We believe that we are successful when internal and external silos are shattered. We share resources and acknowledge and appreciate the assets in others. We value one another by growing, realizing, and recognizing the power within ourselves. We seek knowledge, opportunity, and discovery. We value the intrinsic worth of humanity. We value others by being actively empathetic: giving support, offering time, being flexible, and showing respect. In the last year, the Prosperity team helped 5,443 clients access imperative financial and health services. We helped families move toward comprehensive household wellness by offering non-predatory financial products, financial coaching, free tax preparation, benefits enrollment, healthcare access, and more. In the last year, we enrolled 268 participants in our two-generation leadership development programs. Participants learned about effective leadership, policy advocacy, project design, and how to affect social change in their communities. They represented several neighborhoods in Miami-Dade County. In the last year, we convened over 700 residents through our summits and gatherings. We advocated for local, state, and national anti-poverty policies through direct actions, communications efforts and community convenings. Our multi-stakeholder partnerships enabled us to develop several reports and tools that facilitated the engagement of residents and organizations in policy advocacy. 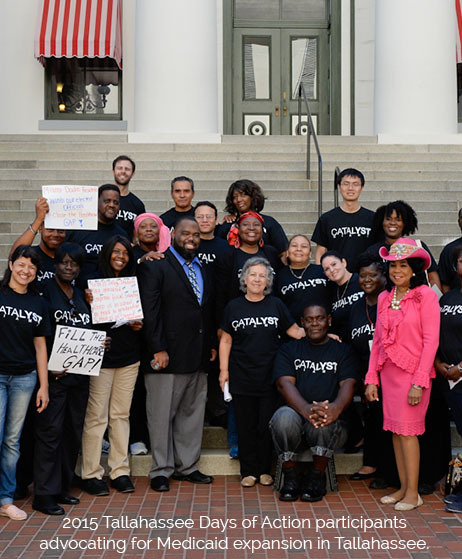 We weaved networks that increased collaboration and strengthened the social justice movement in South Florida.